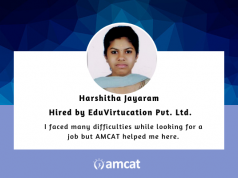 A computer science graduate looking for a fresher job to expand his knowledge and skills, Krishna Keshav came to the AMCAT Test, bereft of placement options. 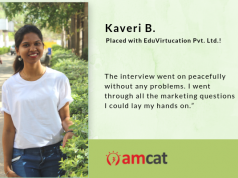 The AMCAT Test is easy to clear once you’re good with your basics, shares this achiever. A computer science graduate looking for a fresher job to expand his knowledge and skills, Krishna Keshav came to the AMCAT Test, bereft of placement options. 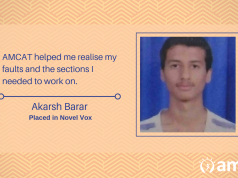 Here is how it helped him gain a technical support position in 42 Hertz Inc.
Keshav, an engineer from PES College of Engineering, Mandya had been looking for a fresher job where he could expand his knowledge and skills and enhance it over time. However, he did not find much luck during his own campus placements. 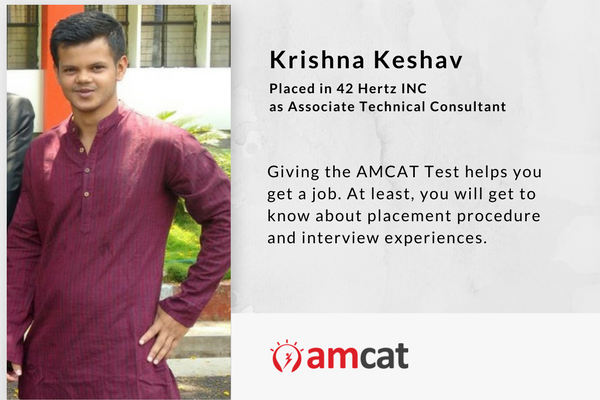 It took some time for Keshav to get job opportunities and the kind of results he was expecting from the AMCAT Test. In fact, he received his first call after two months. Keshav recommends the AMCAT test to all job aspirants. It’ll definitely help you With a job. If not that, at least, you will get to know about the placement procedure and interview experiences. Congratulations Krishna Keshav, for clearing your chance with the AMCAT Test. We hope his tale inspired you to consider giving the test on your own. If yes, then click here and schedule an AMCAT Test for yourself today.